- This quest will trigger semi-automatically once you get Vault 81 open, whether you charmed or bartered your way inside. As you walk across the bridge and into the Vault a cat will rush past you, and someone will mention that it belongs to a little girl in Vault 81. Do not pursue the cat right now. - Return to Erin. (I don’t know if she moves around at this point; I found her in her mom’s store.) She’ll give you a Fusion Core as thanks for bringing the cat back, and will draw the quest to a close. It will also begin the process of triggering another one, Hole in the Wall. IMPORTANT NOTE! This quest is glitchy if you don’t do it in the proper order. 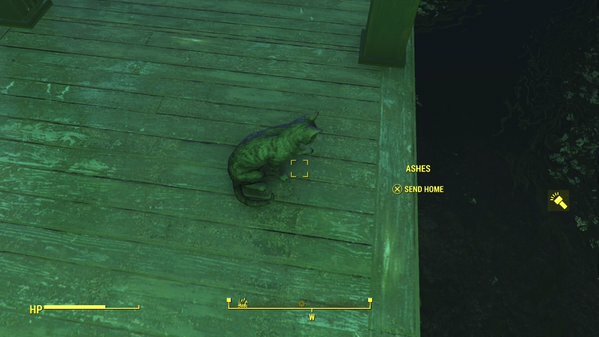 When Ashes runs past you need to stay near the people discussing the cat’s flight from the Vault. Once they suggest you tell Erin about Ashes’ disappearing act you can go talk to her and get the quest. You can also get the quest just by finding Ashes, but this has a strong chance of glitching the game and screwing up Hole in the Wall. If you do run after Ashes, at least let him reach the dock before telling him to go home. This might avoid a glitch.